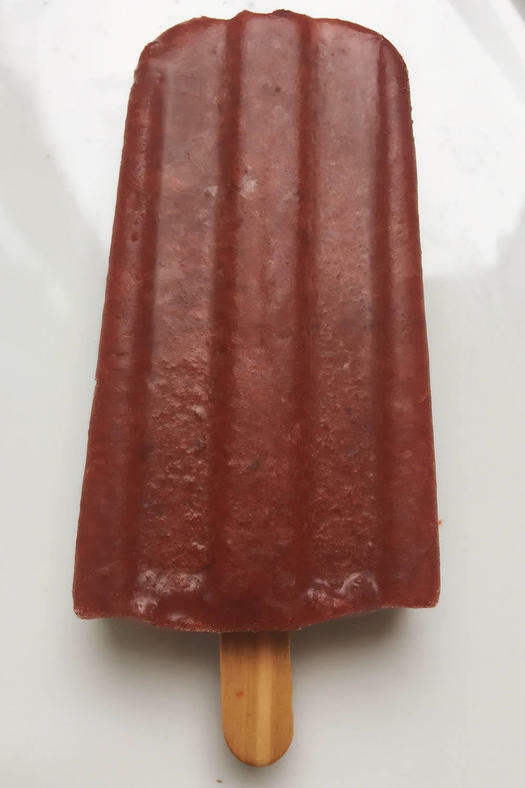 Project: Market Pops, a mobile, pop-up popsicle shop that sells fresh, small batch popsicles in unique flavor combinations. My name is Heidi Nathanielsz and I am the founder of Market Pops. I currently work as the chapter manager for Entrepreneurs' Organization Albany, a peer-to-peer learning and membership organization for leading entrepreneurs. With a background in non-profits, education, marketing and special events, I'm ready to get my own business up and running. I spent two years as the marketing account executive for Capital Repertory Theatre and Proctors, a bunch of years teaching middle school students, and have already been a partner in another small business, Potato Playground (formerly Sweet Potato Prints). That company sold hand-made, potato-printed baby and children's clothing at the Troy Farmers Market and through an online store. We were featured on the Martha Stewart Show in the fall of 2007. I decided to launch Market Pops after a conversation with my two teenage children last spring about the value of interesting summer jobs and what you can learn about the world and yourself when you become an entrepreneur. And as a foodie, I love to create interesting flavors with healthy ingredients; popsicles were the perfect way to explore this approach. I am currently taking the Entrepreneur Bootcamp Course through the Capital Region Chamber of Commerce to fully develop my business plan and explore every facet of launching a start-up with the right foundation of knowledge, passion and network of support. I have a B.A. from Tufts University, and an MEd from Harvard University Graduate School of Education. Market Pops is a mobile, pop-up popsicle shop. We make fresh, small batch popsicles in unique flavor combinations that appeal to the young and young at heart. Our recipes use the best of the season's produce, going straight from farm to freezer, with no artificial sweeteners or preservatives. 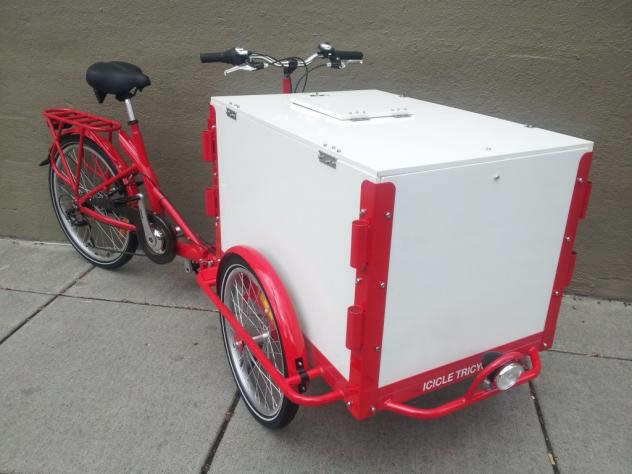 We sell our pops on our "PopCycle," a tricycle equipped with a full cooler on the front (see picture above). You can find us at your local farmer's market (often sourcing our produce from other market vendors), near the Rail Trail, and at special pop-up events across the Capital Region. Fun flavors include lemon lavender, strawberry rhubarb, sweet plum ginger, key lime pie, dulce de leche, Mexican hot chocolate, cherry lime, mango lassi and more! The business model for Market Pops provides a focused, inexpensive investment approach to launching a business. Our plan is to start producing our product and selling next spring to take a seasonal approach to the business running May to October. Our first season of sales is sure to develop a customer-base that may prove to support a year-round endeavor with sales to Whole Foods and other local food co-ops. With no brick and mortar to support (at least at first) we can go where the customers are; our ideal customers are farmer's market buyers (and their kids!) 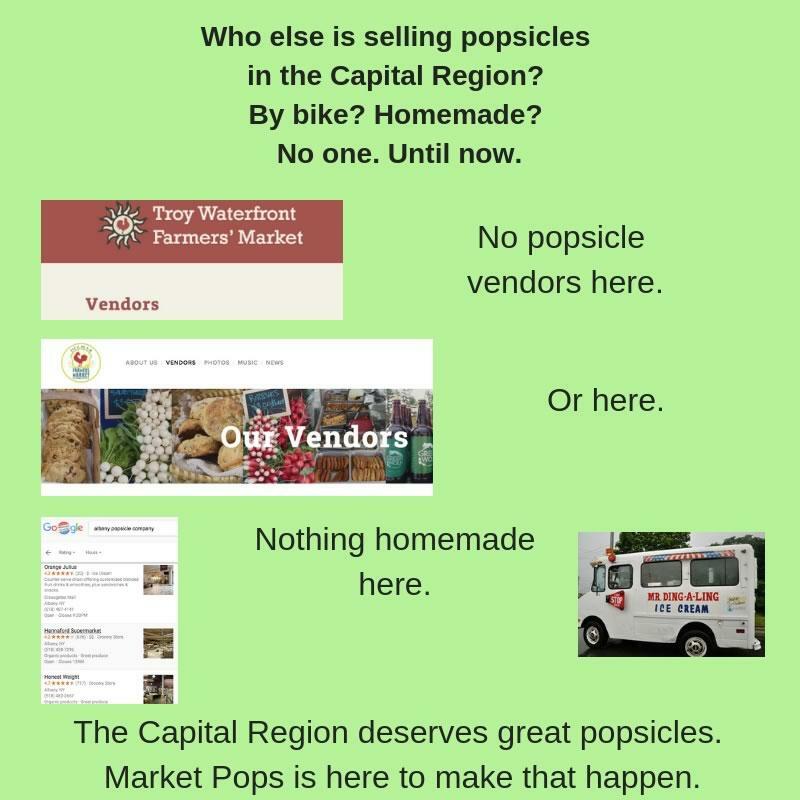 looking for local, healthy warm-weather treats, active families out on the Rail Trail and local bike paths, and festival or special event attendees (booze pops may even be in our future). And we want to appeal to dog-lovers as well with our Pupper Pops - doggies deserve a frozen treat too! 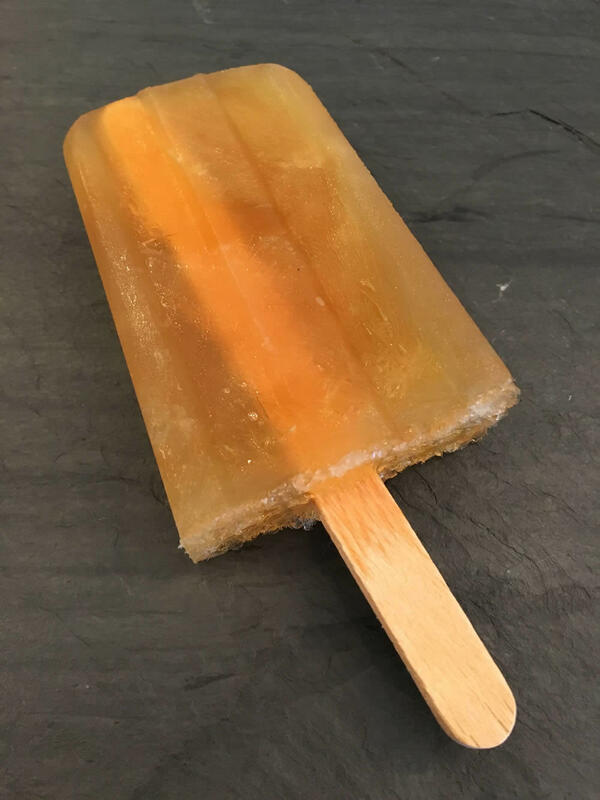 With high-quality ingredients and interesting flavors, the Capital Region is ready for the artisanal paleta/popsicle craze that has taken over other urban areas like NYC (People's Pops), Atlanta (King of Pops), Memphis (Las Paletas, who sold their goods at Boneroo) and numerous other cities. The $2,500 grant would cover the cost of our first "PopCycle" in what I hope becomes of fleet of cooler bikes across the Capital Region. 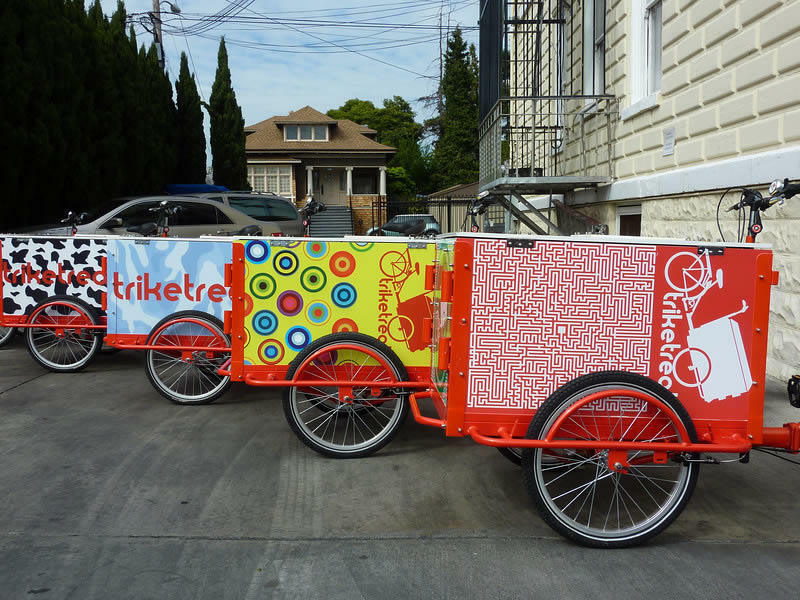 There is a company based in Portland, Oregon that makes custom icicle tricycles. They will brand the bike with our logo and ship to us. A basic bike costs $2100, plus branding and shipping. This grant would be a significant investment in our first fixed asset for the business. In fact, the cost of the bike is almost half of our start-up costs (approx. $5,000). We are bootstrapping the rest of the initial investment.